Don’t throw those orange peels in the trash! I don’t know about you, but with navel oranges and clementines in season right now, I have some citrus peels available everyday! I’d rather re-use items than throw them away if possible. 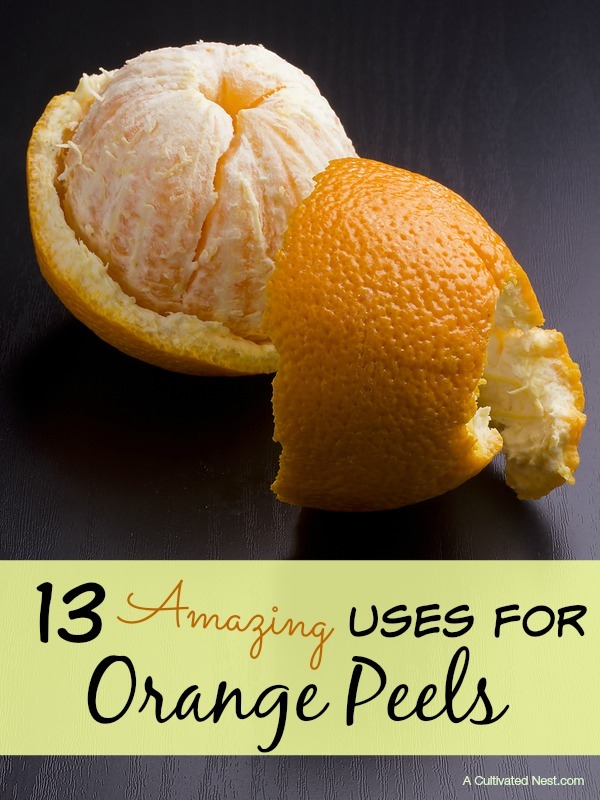 I already had two ways that I used orange peels in my home but since I have so many peels these days I thought I’d do some research and see what other ways you could use orange peels. Here are some great ideas! Recipes are linked as well as examples. 2. I use orange peels to freshen my disposal. Put a few peels down the disposal and run as you usually do until clear. Your disposal will smell nice and fresh! 3. You can add orange peels to brown sugar to keep it from clumping and hardening. It’s suppose to help draw out the moisture. 4. 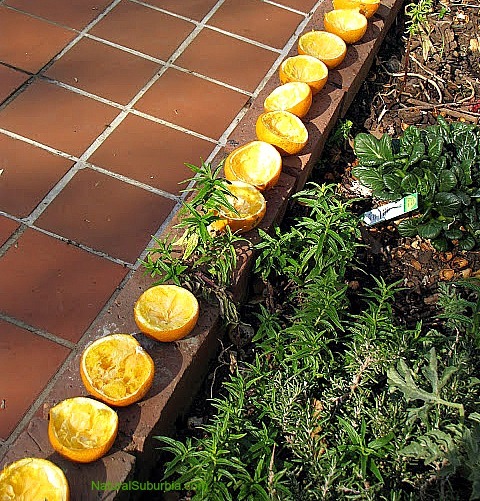 If you dry your orange peels you can use them as natural firelighters (plus they give off a heavenly smell). Check out Natural Suburbia’s post on how to make them into firelighters. 5. Ant and Silverfish are supposed to hate the smell of oranges. Put the peels where you normally find these pests. 6. 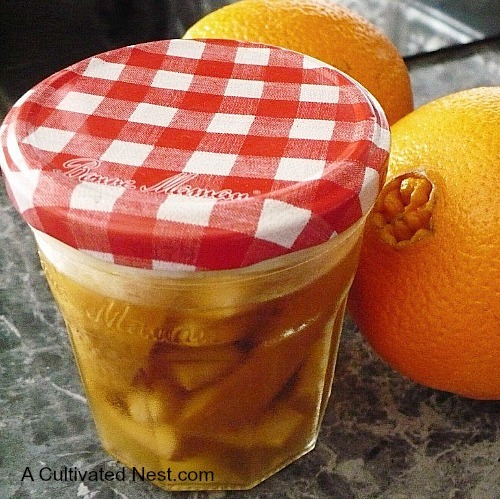 Make candied orange peels! Here’s a easy recipe from Epicurus. These would make a great gift! 7. 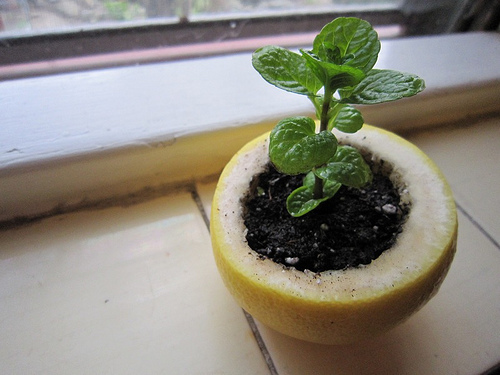 Use the peel as seed starter pot . Check out My Roman Apartment post on the particulars. 8. Zest the orange rind and make orange infused olive oil. 10. Use the peel in stove top potpourris. You can check my post 8 Natural Ways To Make Your Home Smell Amazing for recipes. 11. Dry your orange peels and add a few pieces to your tea. Either use organic orange peels or be sure to scrub your conventional orange well. The orange slices will give your tea a nice orange flavor. 12. 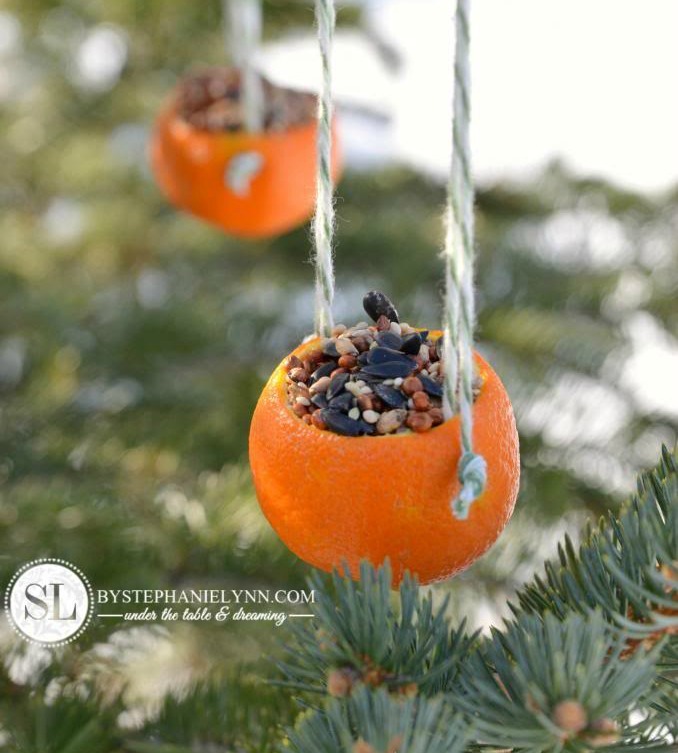 Make a birdseed feeder like this one from By Stephanie Lynn. Check out her tutorial for the birdseed recipe and how to. 13. 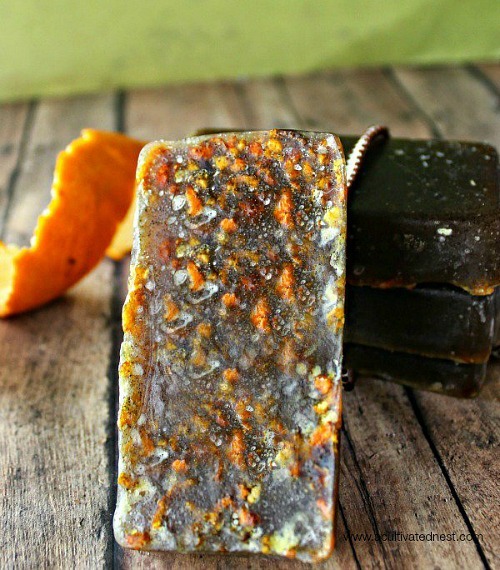 Dry your peels and make orange scented sugar. Again, either use organic orange peels or make sure your conventional orange has been scrubbed well. This would make a lovely gift! As you can see, orange peels are valuable scraps! Don’t toss them! Really good ideas here Manuela! I zest any citrus fruit that I will be juicing, and freeze the zest for recipes. I sometimes buy citrus on the clearance rack at the supermarket, bring them home and zest and juice them and freeze both. It is really handy for those recipes that call for a little zest or juice. What a great idea Kathy! Seems I always need orange zest for something. It’s amazing what you can freeze. We just started freezing chunks of ginger. There’s a mexican farmers market type store in the old town we used to live in and their ginger is $2 cheaper than at Kroger or Walmart. So we stock up and cut it into chunks and freeze it. Then we through a chunk or two in our breakfast smoothies. Hi Manuela! We juice so many organic oranges that I started fermenting the peels! I wasn’t sure if it would work, but as I have previously fermented carrots, orange juice, lemonade, successfully I thought I’d give it a try. I just cut the peels…keeping whatever pulp that remains…into thin slivers (this makes for more tender finished pieces and a faster fermentation). After two or three weeks of fermenting I have a tangy, slightly chewy, healthy treat! I add them to cold smoothies for extra vitamin C and probiotics. Diced small, they also add a delicious tang to tossed salads and sometimes I simply eat them plain to settle a sour tummy. Of course, like all fermented foods they may be an acquired taste! Thanks for all your hard work and inspiration. How are you? So nice to see a comment from you! What a fabulous idea to ferment those rinds! I would never have thought of that. We can definitely add those to our smoothies (we have them almost every morning).